"As long as the Kremlin denies that the Russian army is sending its own troops, officers, intelligence personnel and heavy weapons into the Donbas region, the Russian president must maintain this pose. As long as the Kremlin denies it runs the show in eastern Ukraine, honest negotiations cannot be conducted. … So what is left for President Poroshenko? What is left for the government in Kiev to do? They must prepare the people, for better or worse, for the fact that part of the Donbas, which is still in the hands of pro-Russian forces, is lost." Two hours of face-to-face talks are more than a handshake before the cameras; a meeting is better than a phone call; and an exchange of promises is more auspicious than the exchange of insults. 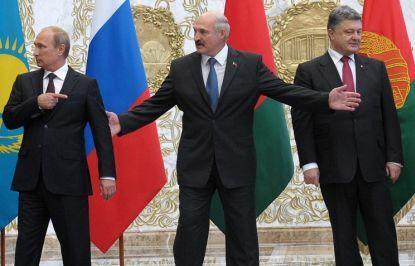 That being said, the outcome of the Minsk summit, at which the Russian and Ukrainian presidents met, was not a success. It is no more than a glimmer of hope in the dark. Vladimir Putin, adept as usual, removed himself from the affair by expressing his desire for peace, while denying any responsibility for that peace. His key sentence was, "Russia will do everything for the peace process, if it begins." If - this means that if Petro Poroshenko negotiates with the separatists in eastern Ukraine, he can go ahead and attempt to implement his own plan for peace. But almost everything contained therein - the ceasefire, the buffer zone on the border, the disarmament of fighters, the pullout of Russian mercenaries, and the withdrawal of separatists from government administrative buildings - would have to be wrung from Moscow's satraps - before, as a second step, theoretically, political reforms could follow. Putin's cynical argument that he has nothing to do with all of this is correct and follows a compelling logic. For as long as the Kremlin denies that the Russian army is sending its own troops, officers, intelligence personnel and heavy weapons into the Donbas region, the Russian president must maintain this pose. As long as the Kremlin denies it runs the show in eastern Ukraine, honest negotiations cannot be conducted. The problem with the Minsk summit is that there is nothing new but a few details. So Moscow has changed its tactics in the Donbas. The Russians, who had the final say on the militia and the administration, have been withdrawn. Locals are once again acting as spokespeople. Was this done because it makes it easier for Russia to distance itself from them; because otherwise, Kiev would have to speak to the Russians about a ceasefire, which would be embarrassing for Moscow? At the same time, the Russian army is quite openly infiltrating the area with convoys, soldiers, and tanks. This is fueling fear among Ukrainians, so that even the smallest concessions from Moscow are welcomed with gratitude. Meanwhile, the number of deaths is growing, the Ukrainian army is experiencing shortages of almost everything, the volunteer battalions are poorly trained, and the number of desertions is increasing. Winter is approaching and patriotic enthusiasm notwithstanding, desperation over the virtually impossible task is mounting. After a speedy victory - a victory no one in Ukraine really dares believe in, the financial, political, and especially the emotional cleanup would have to begin: the enormously expensive reconstruction of a devastated region. Not to mention the difficult reconciliation with those alienated embittered residents who stayed behind despite the intense fighting, but who have now developed just as much hatred for Ukrainian grenades as they have for the Russians. It's doubtful whether more power for the regions, as is planned by Poroshenko, will do much to effect these shattered relations and generalized suspicion. What remains for Poroshenko to do? It is true: Even Putin's separatists may not want to maintain control over and govern the shattered remnants of a decaying industrial landscape in a hostile environment. However, the ongoing conflict, fueled from Russia, is enough to destabilize Ukraine permanently and discredit Proshenko and his peace plan, which is only enforceable with Moscow - not against it. So Vladimir Putin doesn't need to do very much. For now, he can wait and keep the situation in limbo. So what is left for President Poroshenko? What is left for the government in Kiev to do? They must prepare the people, for better or worse, for the fact that part of the Donbas, which is still in the hands of pro-Russian forces, is lost - either because recapturing it would cost too many people their lives and exacerbate the conflict with Moscow, or because talks with the separatists will have to take place, but are unlikely to lead to the implementation of Poroshenko's peace plan. It is true that the plan provides for a constitutional amendment to protect the Russian language and bring new jobs to the region - this is good and right. Only - for the separatists, this would mean Kiev's return to decision-making power over the Donbas. And at the moment, that doesn't seem at all likely. 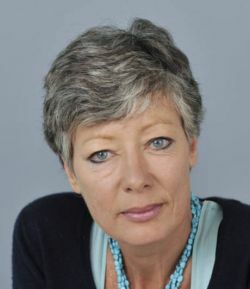 *Cathrin Kahlweit: Russian studies and political science in Eugene (USA), Tübingen, Göttingen, and Moscow, followed by the Hamburg School of Journalism with Gruner & Jahr. Freelance for Die Zeit, Bavarian Broadcasting, then correspondent for Hesse, Rheinland-Pfalz, and the Saarland; return to Munich as part of the domestic policy division, with an emphasis on family and social policy, three years as head of Page 2 (Themen des Tages). Switch to Berlin as editor-in-chief for the talk show 'Anne Will,' return to the Süddeutsche Zeitung, foreign policy division. Currently correspondent in Vienna. Author of Mother of Three Children.